As I recollect, I visited the royal city of Mysore last year. 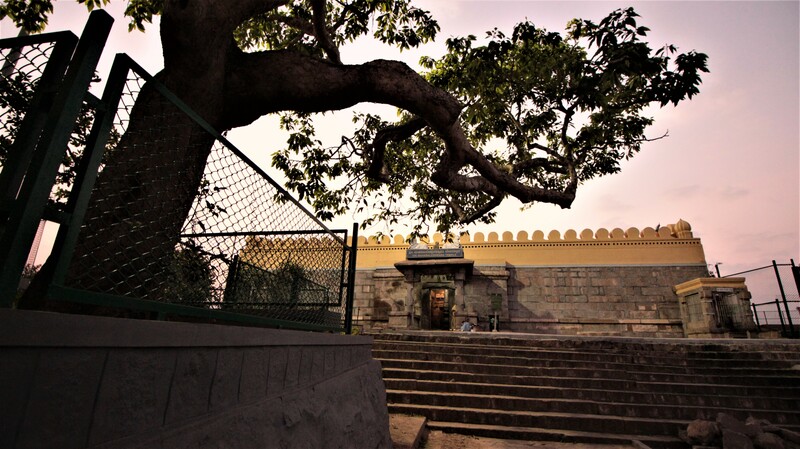 I planned for a quick visit to the Chamundi Temple which is located atop the Chamundi Hills, near to the Mysore city. For me, Mysore is one of the best Indian cities I have ever been to. It is clean, lively and is popular for its beautiful architectural delights, of which the Magisterial Mysore Palace definitely stands out. 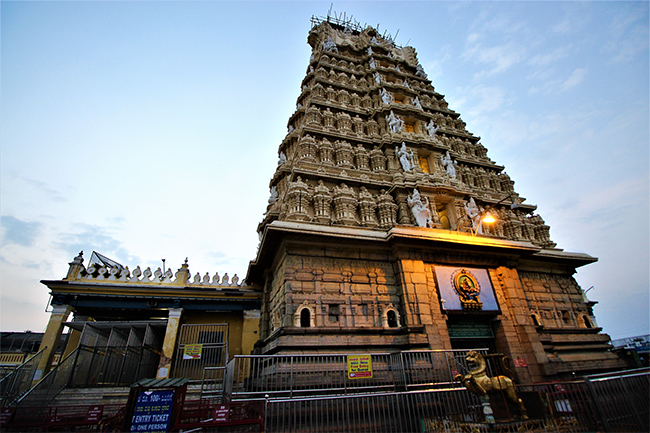 Apart from the Mysore Palace, my favourite pick is the Chamundeshwari Temple at Mysore, located atop the Chamundi Hills. The drive to the Chamundi Hills was for sure the best part of my trip. I reached Mysore shortly before dusk. Since I was to return back to my hometown the next day, I asked my driver Pradeep to drive me through the city and to give me a quick city tour. 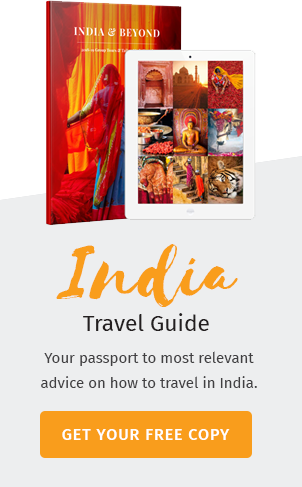 I had a quick glimpse of the most prominent sightseeing places in Mysore, the Mysore Palace and the Jaganmohan Palace. Since I was informed that both the palaces close before 6 pm, I did not bother getting out. Both the structures are admiring. First up, the Jaganmohan Palace hit my eyes. I was like “Wow”, it looks simply brilliant, but soon I saw a structure gleaming gold. I could see only a portion of the building, perhaps I was having a side view of the structure. I asked Pradeep to stop and enquired about the same. Sensing the excitement in my eyes, he smiled at me and told “Just wait a minute sir, I am taking you there only. I have got the right spot for you where you could enjoy a grand view”. I did not speak as I was already enjoying something eye-pleasing at Mysore. After a couple of minutes, the driver stopped the car and pointed out his fingers to his left. He said “Sir, you are at the famous Ambavilas Palace of Mysore”. “Yes sir, it is the same Mysore Palace”. There it was, a ginormous palatial structure posed its might right at the heart of Mysore city. Elegant, charming and extremely beautiful, the Mysore Palace, for me, is something we could compare to the Taj Mahal of North India. 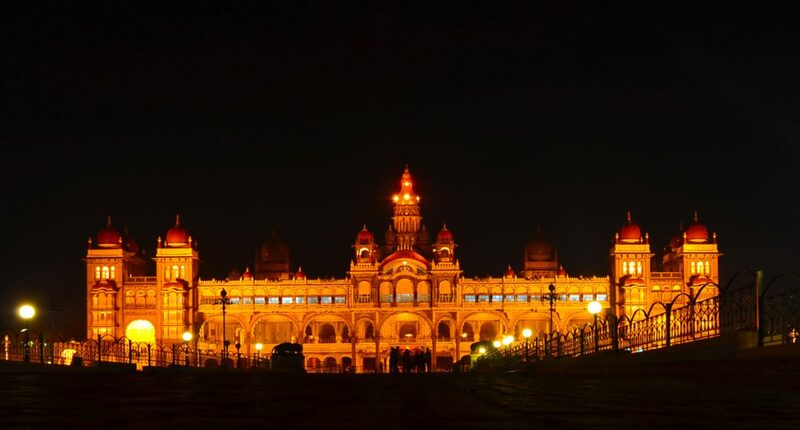 Then and there I decided, I am coming to Mysore again, solely to explore the magnificence of this glorious palace. The next day, as per my plan, I was to visit the Chamundi Temple and return back to my hometown. 7 am in the morning we started our drive to the Chamundi Hills. 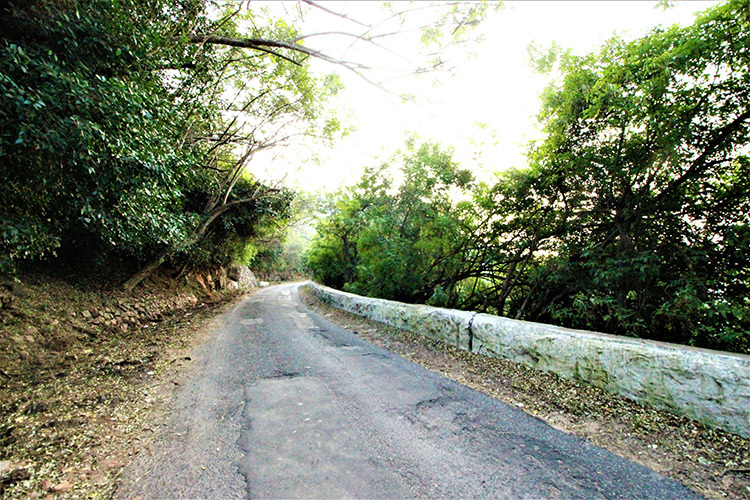 It is located 3500 feet above the sea level and 800 feet above the Mysore city. 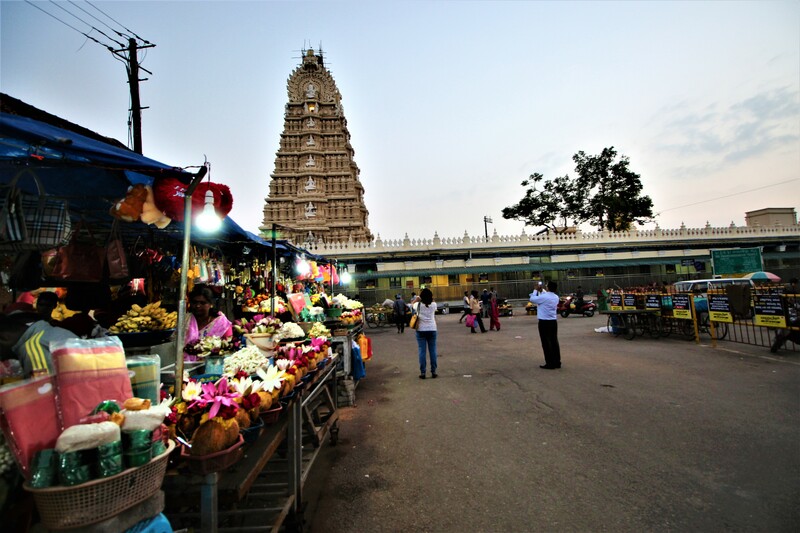 A 12 km drive from Mysore will take you to the Chamundi Hills. After a 15 minute drive through the morning traffic, we reached a roundabout, from where we took a right deviation. I saw a sign-board stating “Way to the Chamundi Hills”. Pradeep informed me we would reach the Chamundeshwari Temple in another 15 minutes. The road to the Chamundi Temple consists of few hairpin bends as well, which exposed us to some of the lovely vistas of Mysore city. We drove along lush greenery on both sides and it was great. We stopped at few spots to click quick snaps of the Mysore city downhill. Next up we stopped at the Chamundi Hill View Point. 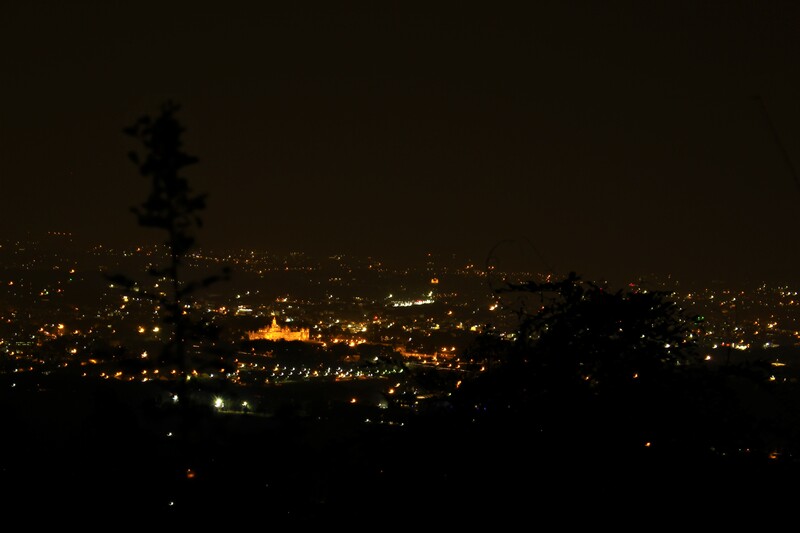 There are 2 heavy binoculars installed for the tourists to have a good view of the Mysore city from the Chamundi Hill. A guy stands there who collects 20rs/head to use the binoculars. I enjoyed a good view of the Mysore Palace zoomed in, the Race Course, St. Philomena’s Church and the whole city. It is worth a shot. After 5 minutes and 2 km, finally, we reached the famous Chamundeshwari Temple at Mysore. Again! I was in awe, seeing the mighty structure of this near-1000-year-old temple. Of course, at the first look itself, it looks pure Dravidian. The seven-tiered Gopura is its striking feature, and the silver-plated entrance tells a lot about its regal past. The Chamundi Temple is believed to have been built by the Hoysala kings in the 12th century AD. Later Krishnaraja Wodeyar III, in 1827 renovated the temple. By 9 am, I had the Darshan of Goddess Chamundi or Durga, seated on a lion and holding a Trishul [a trident]. Being an avid devotee of Goddess Durga, it was a blissful sight for me. After the Darshan, I came across another temple near to the Chamundi Temple, a lesser known, Mahabaleshwar Temple. It is a 2000-year-old Shiva Temple which is not popular considering the fact that it is located near to the much popular Chamundi Temple. I went on to explore the local markets near the temple, click few snaps and thoroughly enjoyed the pleasant weather and the surroundings. We started back by 11:00 am and reached Mysore at 12:30 noon. As I was supposed to catch my afternoon train to get back home, I left Mysore shortly after lunch. It was a short trip, but the experience was intense. I made up my mind and still keep on telling myself that I am going back to Mysore again sooner or later to have a much longer tour, to have a much deeper experience and visit all the beautiful sights the city of Mysore has to offer.